Old map by ORTELIUS - Indiae Orientalis, Insularumque Adiacientium Typus. 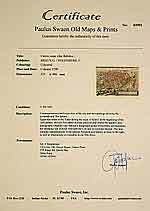 Title: Indiae Orientalis, Insularumque Adiacientium Typus. Size: 13.6 x 19.4 inches. Condition: Paper slightly age toned along the center fold. For the rest in mint condition. From a Latin text edition. 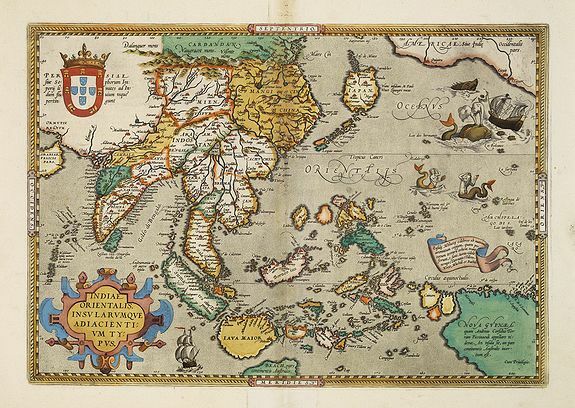 Finely originally hand coloured example of Ortelius' map of SE Asia, Japan, and the Philippines, etc. The map includes Beach and other information drawn from Marco Polo. The map also includes a portion of the West Coast of North America, including several mythical names in California. Based upon Mercator's world map of 1569. The difficulty of mapping this archipelago was such, that for centuries to come maps of this area remain faulty. Sumatra and Java are heavily oversized, and the Philippines are incomplete and without the Northern island of Luzon. The mermaids, who are beautifying themselves rather than heeding the whales' attack on nearby ships, are based on those occurring on Diego Gutierrez map of America. The map is in a strictly contemporary colouring and of the highest level. Reference: V.d.Broecke, Ortelius Atlas Maps, 166..